"Shoe-makers often wear bad shoes..."
(In Canada you say: "Auto mechanics often drive the worst maintained autos.."
In the title of my homepage, I specified "The Only Genuine One", because other people use my name, without embarrassment, to identify their web site. Stop Copying, Be Creative! Do you enjoy these creations? Do you need pictures, websites or softwares? Contact me! is licensed under a special Creative Commons Attribution License. (you can verify there if you have an authorisation to use some images). Beeper... Your desktop will enjoy this nice-looking DonationWare! For a long time I use “FileZilla”, the free quality software which makes possible to manage FTP transfers. Nevertheless I always found the icon a little old-fashioned. In spite of the release of the successive versions, nothing changed. 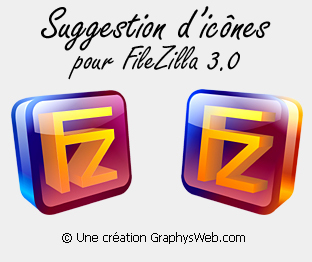 I thus propose, for the version 3.0 (in preparation) following icons (click on the picture)! The solution to choose a combination for the pulling of euromillion without falling into the traps from the grids or the ticket flash! The Large Million is a software freeware (free) which randomly generates 5 numbers and 2 stars. Azerty I, II, III for Firefox & Azerty 'mail for Thunderbird ! This script doesn't need any change each year: it works for ever! And you can adapt it according to your own language.